Smog Checks, Brake Repair, Car Repair & Fighting Hunger! We'll make your Star Certified Smog Check easy and fast. We're in a great location near local shops and restaurants. Plus we're an official drop off station for the Alameda County food bank. With the help of our community, we've collected over 10,000 pounds since 2008. 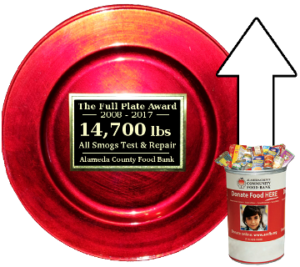 Donate two canned foods and save and save $5 on your smog service. Contact us for an appointment. Make sure your Star Certification is legit. 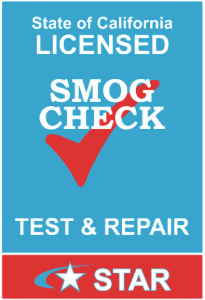 Get your smog check done by a Star Certified Smog Station. We're Star Certified by the California Bureau of Automotive Repair (BAR). Plus we're BAR certified for car repair. Have peace of mind across the board. We cover all bases with our car repair service. Get a full 30, 60 & 90k service tune-up by appointment and at a competitive rate. Plus we do brakes, tires and wind shield wipers! We are ASE certified. We love what we do. We've been doing it for years. We are active in the community and support the Alameda County Community Food Bank. Plus we're just behind Three Sheets Craft Beer Bar. See what our customers have to say about our smog check and auto repair service. We have over seventy 5/5 star ratings on Yelp, Google+ and Facebook. Great service and very friendly. I showed up without the paperwork from DMV and the guy was very helpful. Took less then 15 minutes for the whole process. Contact us for a smog check, brake inspection or to repair your car. The Best Location for a Smog Check! Donate two canned foods and save on your service. We're determined to break our annual record this year. Join us! For a star smog check, brake inspection or to repair your car Request an Appointment Online or Contact us. We are rated 4.9 out of 5.0 based on our last 19 reviews. And we have over 70 five star reviews on Facebook, Google & Yelp combined.